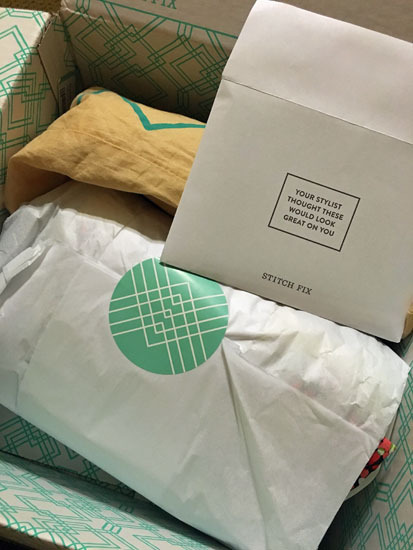 A couple of months ago, I received an email from Stitch Fix and was delighted to discover a promotion for a FREE Fix. 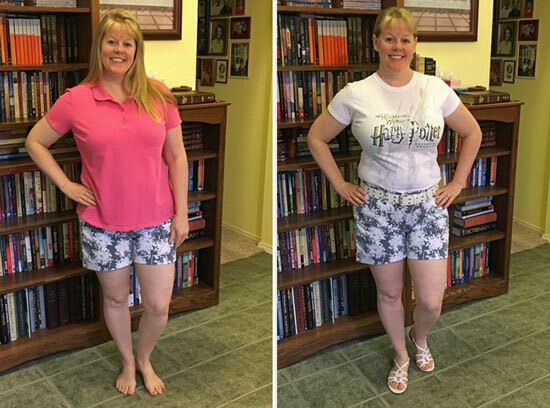 Since it had been quite a while since my last Fix, I scheduled one and asked for casual summertime clothes. Just like my first Fix a few years ago, this one arrived in a nice box with the clothes wrapped in tissue paper, the shoes in a nice cloth bag, and the invoice/note and styling suggestions in an envelope. It's so FUN to get pretty packages in the mail! I actually liked all five items in this Fix, however I ended up sending four of them back for various reasons. 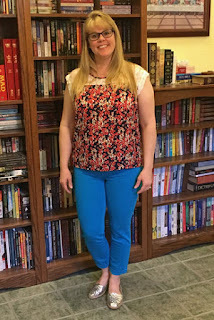 I tried on the first three items together - a Papermoon Birch Lace Detail Blouse, Lila Ryan Dorianna Skinny Jeans, and Seychelles Nifty Woven Flat. I really liked the color of the jeans, but I'm not yet at a size that I feel comfortable in skinny jeans. The silver shoes were really cute, unfortunately they fit too tight across the top of my foot. 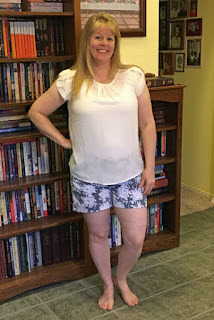 I think the Papermoon Bastille Tulip Sleeve Blouse did not work well with my coloring and definitely didn't work with the Dear John Finnegan Printed Cuffed Shorts. 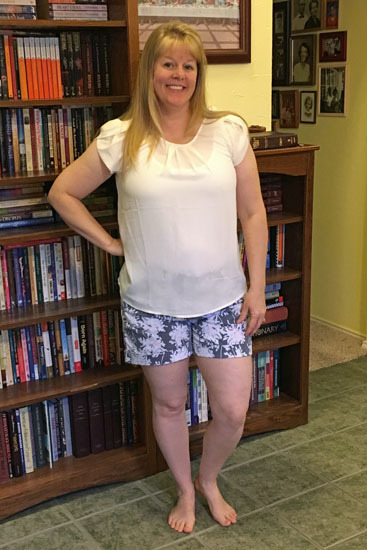 So, the only I item I kept was the lace detail blouse, which I paired with capris and sandals for a summer night out. 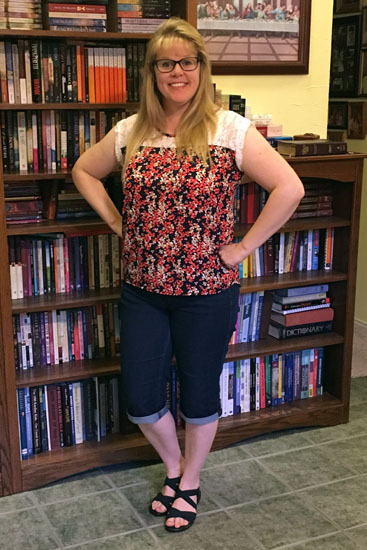 I've also worn this blouse with a blue skirt and heels to church, and think it will look great under a denim jacket when the weather turns cooler later this fall. The great thing about Stitch Fix is that I don't have to go shopping!! Five items are delivered right to my door, with a prepaid return envelope ready for the items I decide not to keep. The $20 styling fee goes toward any items that I purchase. I'm scheduling another fix next month! Want to join me? 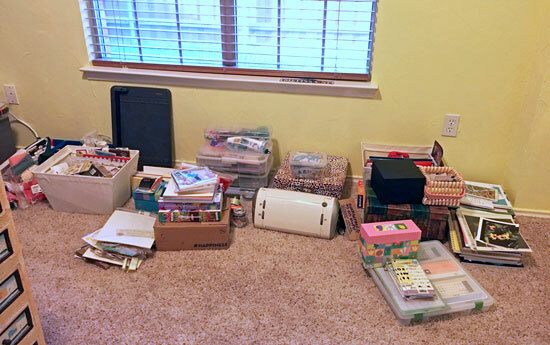 The hardest part of sorting, organizing, and moving all my stash into the new craft room is fighting the desire to create something right now! 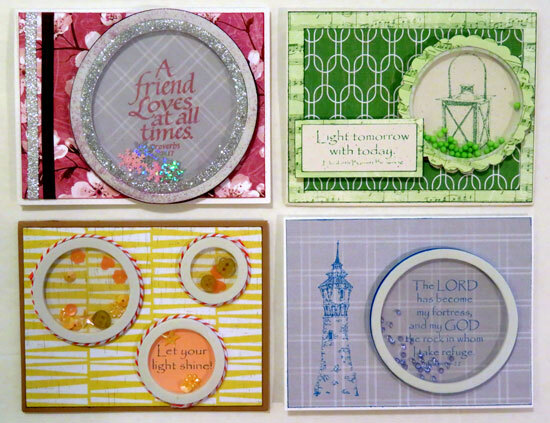 Piles of pretty paper and drawers of colorful embellishments are so FUN to look through! I'm a little over halfway through the move-in process, so I thought I'd stop and share a peek at the progress so far. 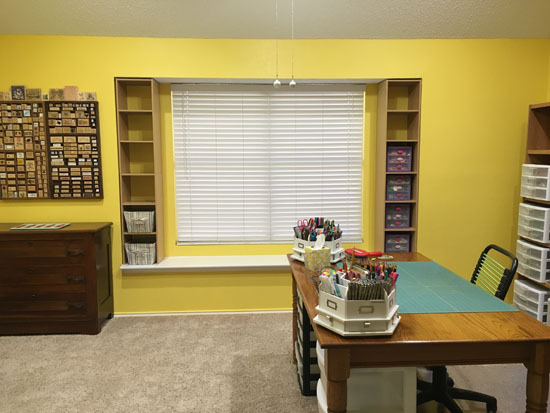 If you've been around this blog awhile, you'll recognize the set-up of the right side of the room because it's basically the same as my main wall from the old craft room. Here's a closer look at the Expedits. You can see that there are still empty spaces and drawers (on the left bookshelf) as I'm steadily working to get everything in place. 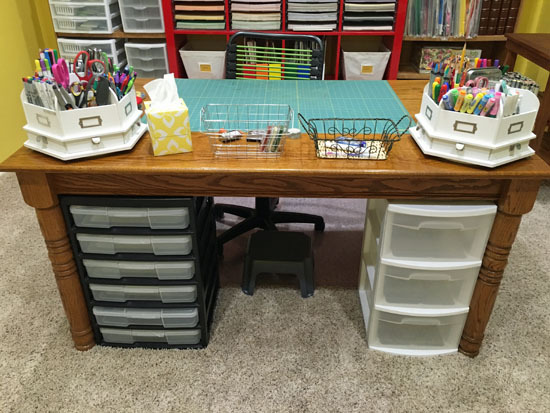 I've added some plastic drawers/containers underneath the table that will also hold supplies. The view looking into the room from the hallway shows the fantastic window that lets in lots of light and creates an open airy feel. The shelves on each side were actually closet storage units that we found at Target when Robbie first moved his toy room in here. 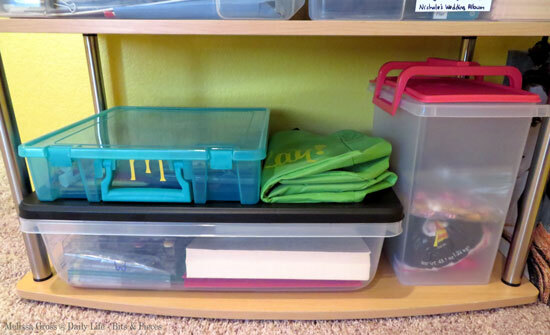 They work perfect to hold drawers and bins. Currently I'm working my way through all the piles of remaining items that need to be incorporated into the room. 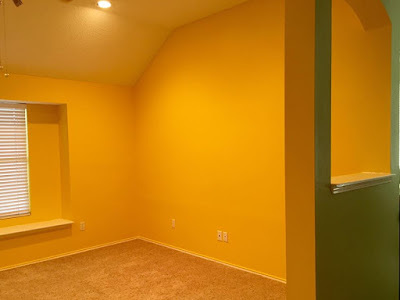 This morning one wall of the front room (where everything is haphazardly waiting to be moved) looked like this. Next I'll be tackling the piles under the front room window! 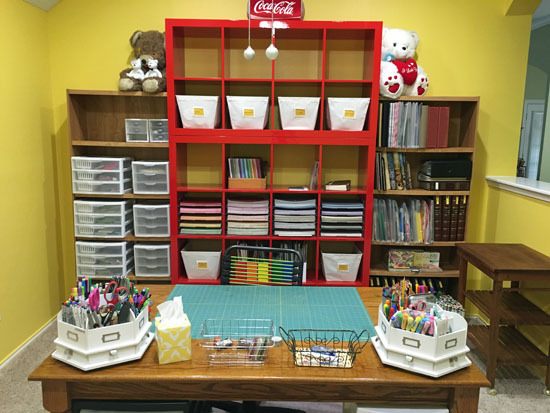 Do you enjoy sorting and organizing? Does it leave you inspired to create? The first piece of furniture I moved into my new craft room was a three-shelf unit that wouldn't fit in Robbie's new collectible toy room. I knew I wanted a place to put current "work" projects, and these shelves fit the bill perfectly! 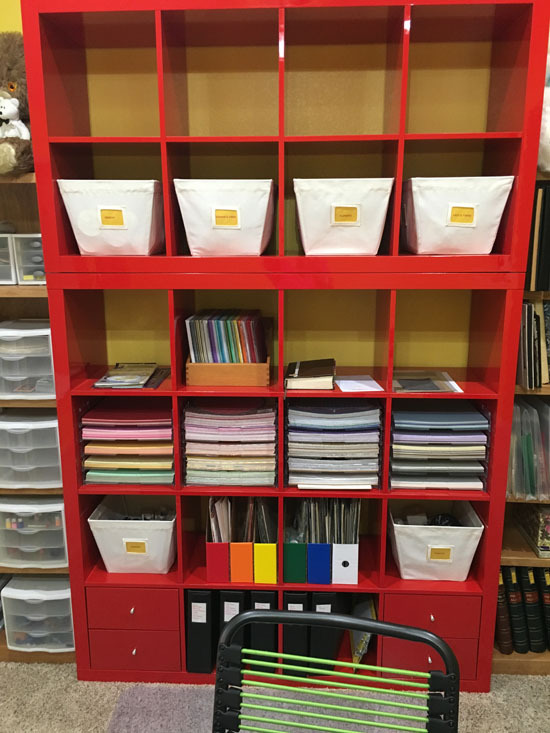 The top shelf holds a container for each of my upcoming card classes; each container works to hold the supplies, directions and kits I'll need to teach the class. 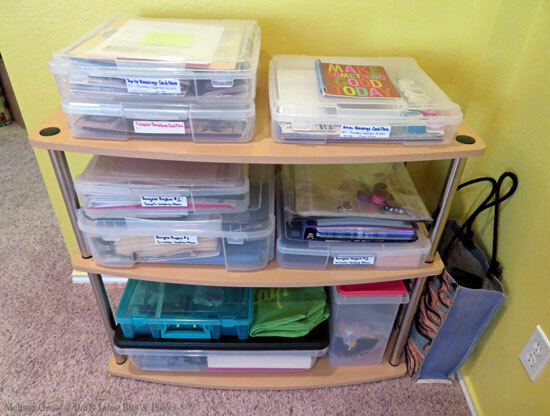 I used similar containers on the second shelf to hold photos, memorabilia and supplies for each of the three custom scrapbook-for-hire projects I'll be working on in the coming weeks. 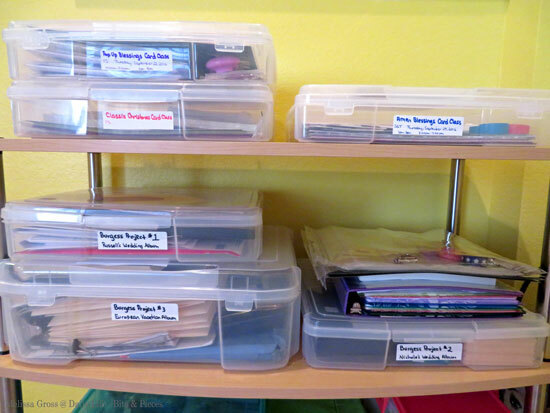 Obviously the items on this shelf unit will rotate in and out often as I complete classes and plan/prepare new ones. I'll also be completing custom scrapbooks and (hopefully) beginning new ones on occasion. 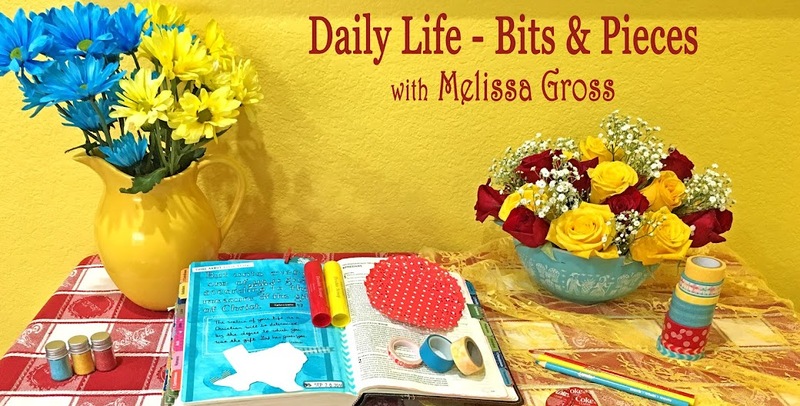 I use the Bible journaling supplies often and restock as needed. I'm so excited to have this designated place to keep track of current "work" projects (which I really enjoy too much to consider "work"). 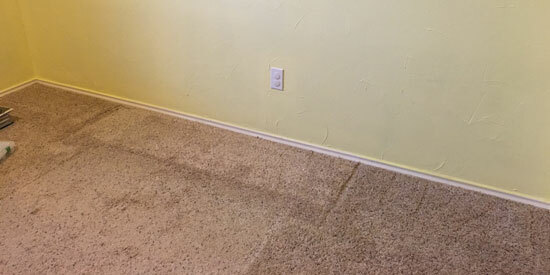 Do you have a designated place for these types of projects - classes, design team assignments, etc? 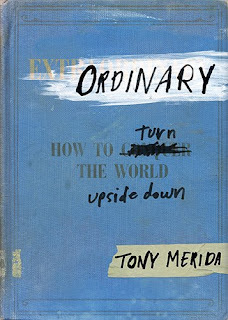 When I received my copy (free from B&H Publishers in exchange for an honest review) of Tony Merida's Ordinary: How to Turn the World Upside Down, my first thoughts were: this is a much smaller book than I expected and they could have done a much better job with the cover! This thin hardback book is approximately 7" x 5" and has a distressed looking cover reminiscent of an old long-lost book you might find in someone's attic. 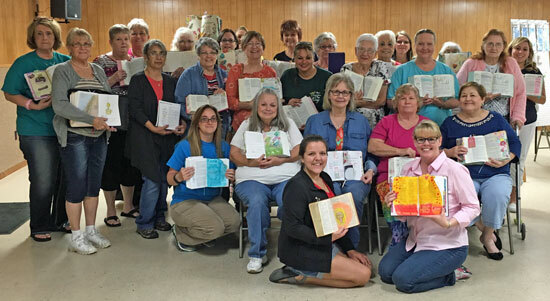 However, the message inside the book is powerful and thought-provoking.The author asks, "What if the path toward an extraordinary life is becoming more ordinary?" He then shares how ordinary people, doing ordinary things (like performing simple acts of service, showing neighborly love, offering hospitality, supporting or pursuing adoption), can make a huge impact in our world. In the preface to the book, the author quotes Aristides reasons for the influence of Christianity in AD 125. Among other things, Aristides said that Christians "do not worship strange gods...go their way in all modesty and cheerfulness...love one another...deliver the orphan from him who treats him harshly...gives to him who has not, without boasting...fasts two or three days in order to supply to the needy their lack of food." Wow, I wonder if someone were describing Christians today if he would use these same words. *Christians should be indignant toward evil, yet compassionate toward its victims. *Love involves action, not indifference. It involves compassion that leads to action. *Evil will triumph when people do nothing. This is a book I'll be keeping in my personal library to reread . . . despite its size and distressed looking cover! A few days ago I completed the August pages in my 2016 Gratitude Journal! 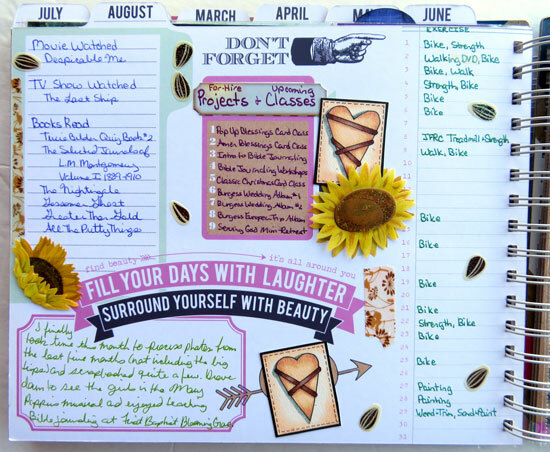 For the first page, I added my lists and journaling, then used some hearts from a cut-apart paper and a sheet of sunflower & seeds stickers as embellishments. I included a photo I took on the first of the month as I'm documenting my not-so-successful attempt to lose weight and make healthier choices this year. Then I have a couple of photos and pieces of memorabilia from my trip to southeast Texas. The bottom left slot holds the envelope that held a $25 gift card that I won from the library for attending various events this summer! 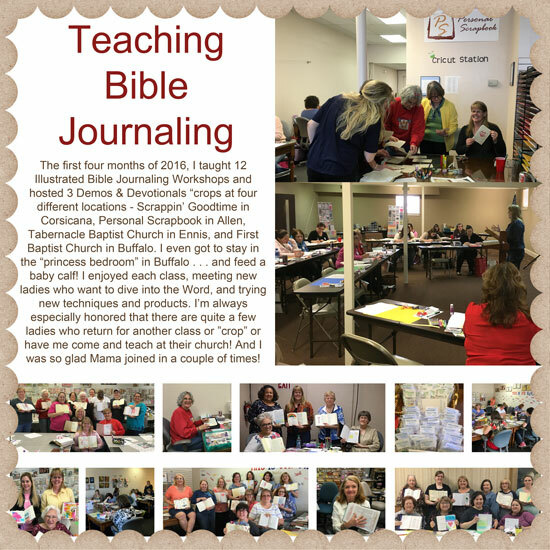 The top row on the back of the pocket page holds photos reflecting my Bible journaling, preparations and teaching during August. 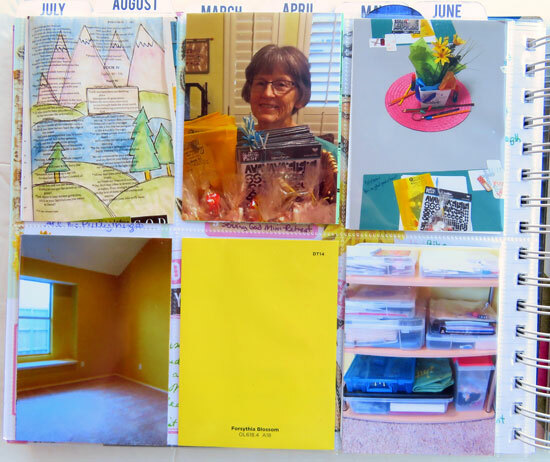 The bottom row has photos of my new craft room and a paint chip with that lovely Forsythia Blossom color that now adorns the walls! And finally I added matching embellishments to the calendar page where I recorded something I was grateful for each day of the month. I know I say it every month, but I really am pleased with how this project is turning out! What were you grateful for in August? Can y'all believe we're already a week into September! I started the month out with a meet-up with Cheri and her mother and daughter. 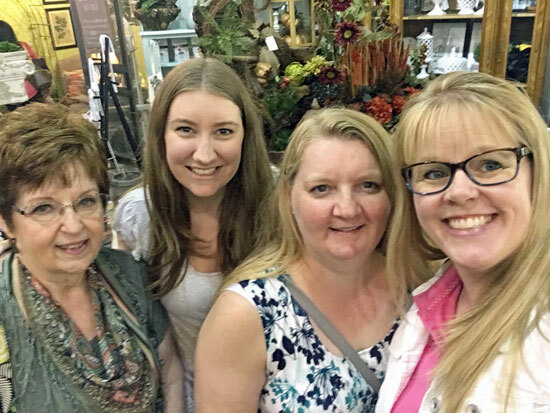 We had a great visit over lunch and a stroll through the Frisco Mercantile. Its always so much FUN to get together with friends! 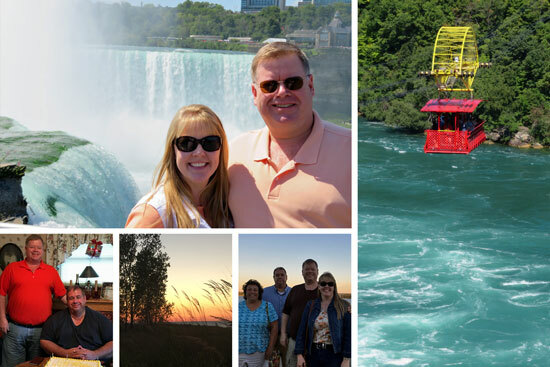 Robbie and I left the next day for a long weekend trip that included flying to Ohio, driving through Pennsylvania, spending a couple of days in Buffalo, New York, visiting Niagara Falls, riding the Whirlpool Aero Car, and celebrating Robbie's brother's birthday. 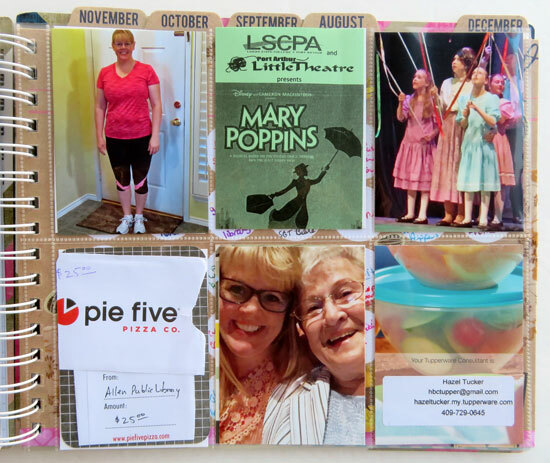 This month is flying by already, so here's an update on my 2016 goals (MOVE, LEARN, TEACH, SCRAP, CLEAN). MOVE - I did better on my exercise in August than I have the previous few months. I got in a workout more than half the days throughout the month, had a great check-up at my annual physical, and got in some additional activity painting my new craft room (photo below). 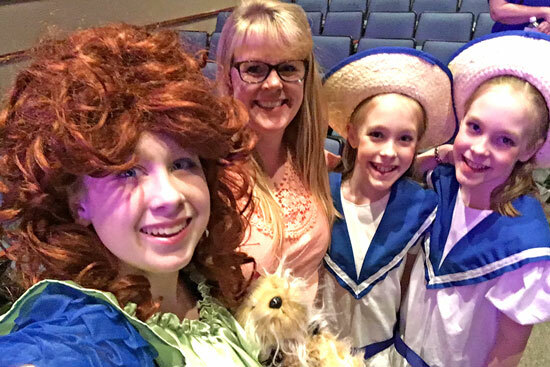 My adventure for the month was a quick overnight trip to Southeast Texas to see three of my nieces perform in the local production of Mary Poppins. 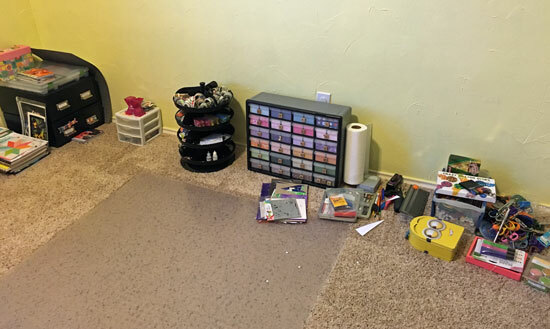 I'm having a slow start to my exercise this month since we were out of town, but I'll be getting in lots of activity as I move my furniture and supplies into the new craft room! 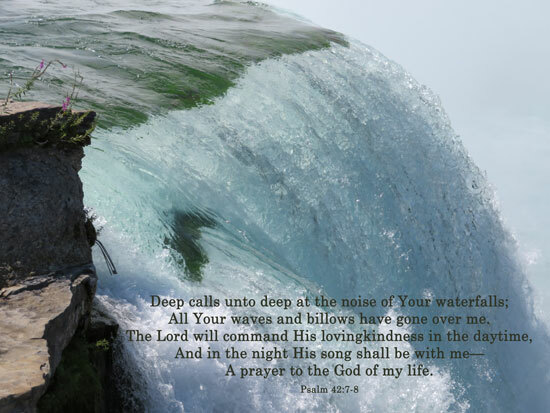 LEARN - Despite the fact that I didn't keep up with the prompts each day, I enjoyed The 20 Project class and will be continuing to work through the remaining INSPIRATION at my own pace this month. 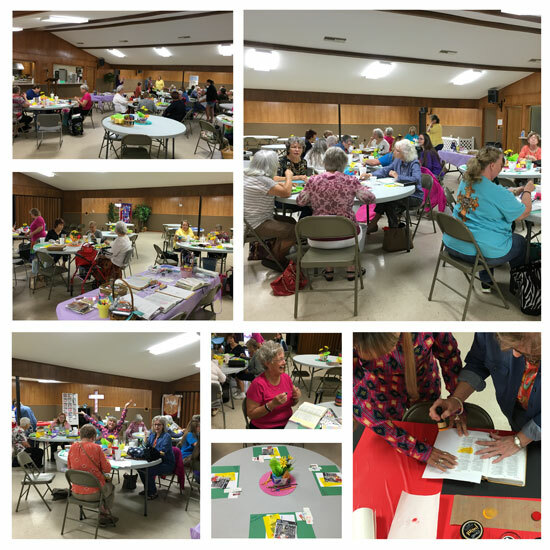 TEACH - I taught two sessions of Illustrated Bible Journaling at First Baptist Church in Blooming Grove, Texas, one Saturday last month. It was a FUN day, filled with lots of laughter, good food and tons of creativity. I thoroughly enjoyed the day and the welcoming friendly group of ladies who joined me! 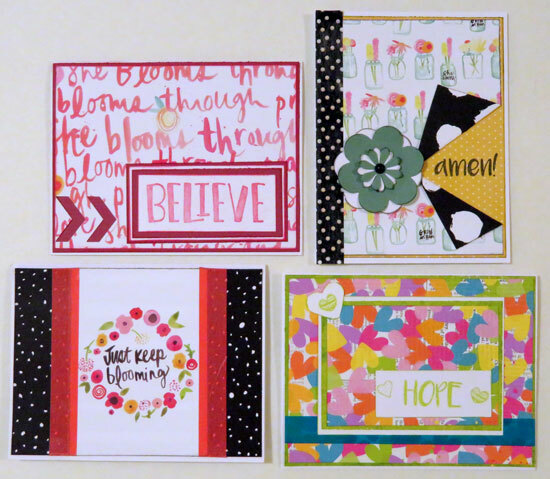 This month I'll be teaching two card classes and an Intro to Bible Journaling workshop. 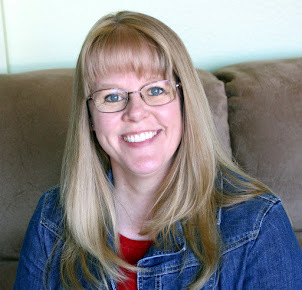 (Check out all the details on my Upcoming Classes Page.) Here's a look at the cards I created for the card classes. SCRAP- I created 17 layouts in August: ten traditional 12x12 layouts, six pocket page layouts, and one digital layout (below). 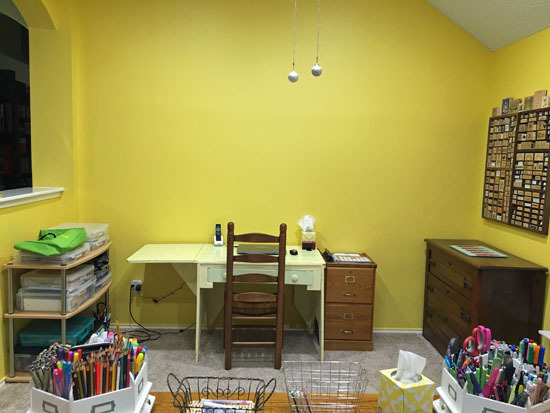 CLEAN - We moved the last few items out of the old toy room and spent a couple of days painting the walls Forsythia Blossom, so this month I'll be setting up my new craft room in this happy space! 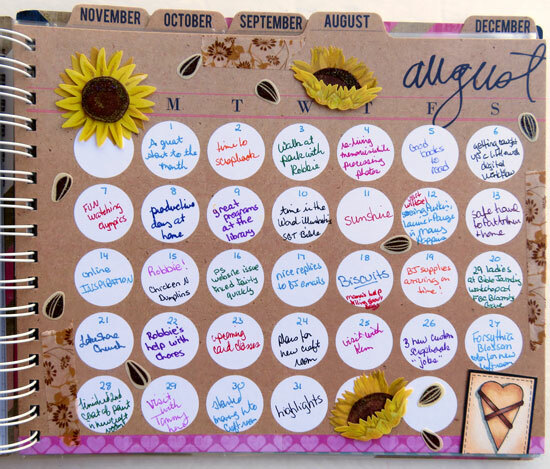 Did you accomplish your goals for August? What are your plans for September?